Missing Monday’s Eclipse Farmington Hills Residence? By the beginning of Farmington Hills’s new week, Monday’s eclipse had been so thoroughly chronicled as having been “99 years in the making!” you could be forgiven for any anxiety that might result if you’d been unable to arrange to be where viewing was best. After all, we’ve been hearing from all corners that such an event doesn’t always happen within any given lifetime, for goodness sake! The undeniable takeaway was it’s now or never! Better have those proper viewing glasses at the ready, and get yourself over to where the cloud cover isn’t. This is not to minimize the grandeur of the occasion of the eclipse Farmington Hills will see. We may be treated to lunar eclipses from time to time—but a solar eclipse interrupts the natural order of things with its literally show-stopping astronomical spectacle. Anyone who has been tempted to fly off to a foreign venue to view one (they happen twice a year, somewhere on the planet) too often learns that it’s also risky business, meteorologically speaking. I recall a news item from a couple of years back about a tour group that set off for South America—where it clouded over five minutes before the event. If you were one of those crestfallen tourists, you’d have returned with little more to show for your expensive effort than a llama snapshot or two. But in case you were one of the few Farmington Hills locals whose Farmington Hills eclipse experience turns out to be less than stellar, the pressure is off! Although it’s been 99 years since the last total eclipse crossed the mainland, there’s going to be another one, and soon (relatively speaking). You won’t have to wait until 2116, either. It’s due only seven years from now! In other words, on April 8, 2024, Farmington Hills residents will have a second chance. The whole once-in-a-lifetime spectacular will have a return engagement. Not since Cher’s most recent retirement tour has such a déjà vu opportunity been in prospect. The path will be quite different—southwest to northeast instead of northwest to southeast—so the Michigan and Farmington Hills experience will be different—but since we will all be solar eclipse veterans, we should be well prepared for the experience. So let’s hang onto our eclipse viewing glasses—or if we never found any for sale, we’ve got nine years to correct the oversight. 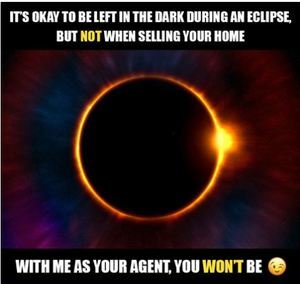 In the intervening nine years, whenever any of the more terrestrial Farmington Hills real estate matters arise, I hope you’ll give me a call!